Epimedium, also known as Bishop's hat, is a genus of flowering herbaceous perennials native to eastern Asia. They produce small flowers which can be yellow, violet, white or pink in color, and bloom during spring. They can grow up to 1.5 feet in height and are commonly used in gardens as ground cover. Epimedium plants require little care once established, and can thrive in most temperate locations around the world. 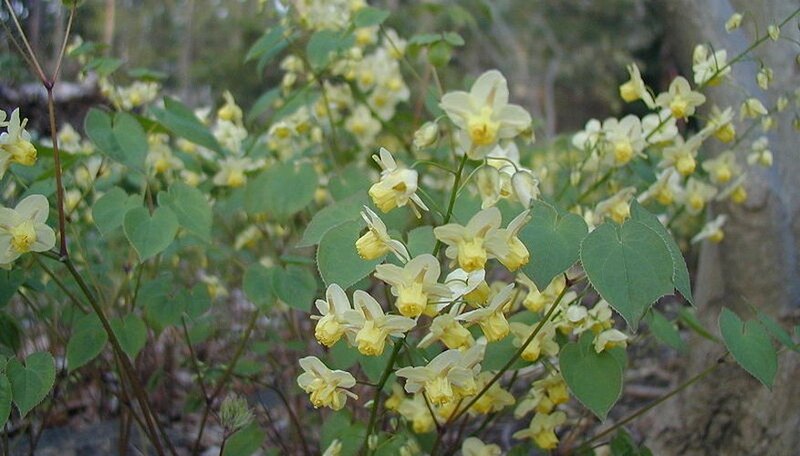 Plant epimedium during early spring in any soil that is well-drained. Ensure the location receives partial sun for best results, but deep shade works as well. Dig a hole slightly larger than the root ball, place the epimedium directly inside and cover the roots with soil. Water thoroughly to compact the soil around the roots, and to collapse any air pockets. Sprinkle 10-10-10 NPK fertilizer around the newly planted epimedium, and then water again to prevent root burn. Water epimedium once per week during the first growing season. Reduce watering to once every two weeks after the first year. Do not water epimedium on weeks that receive more than 2 inches of rainfall. Feed epimedium plants twice a year, in spring and again in late fall. Use a balanced 10-10-10 NPK fertilizer to provide all the nutrients required. Water both before and after applying the fertilizer to incorporate it into the soil. Spread a 2-inch layer of mulch over the soil surrounding the epimedium. This will conserve moisture and reduce the growth of weeds, which compete for nutrients. Refresh the mulch whenever it has deteriorated or the soil is visible. Epimedium can be grown from seed, but can have significant difficulty germinating and sprouting. The easiest method for growth is from a division or a potted epimedium which can be purchased from a nursery or lawn and garden store. Use pine needles or chopped leaves as mulch for epimedium plants.